Presentation of XtreemOS 2006-2010 scientic project that developed XtreemOS software. You'll find here presentation of the XtreemOS project, which was the organization that developed XtreemOS. This project started in June 2006, ended in december 2010. For your information, nowadays XtreemOS software is sustained by two engineers working at INRIA Rennes, in Myriads research team, plus anyone willing to work on it. The XtreemOS consortium composition is a balance between 19 academic and industrial partners interested in designing and implementing the XtreemOS components (Linux extensions to support VOs and Grid OS services), packaging and distributing the XtreemOS system on different hardware platforms, promoting and providing user support for the XtreemOS system, and experimenting with Grid applications using the XtreemOS system. Different end-users are involved in XtreemOS project, providing various test cases in scientific and business computing domains. Istituto di Scienza e Tecnologie dell'Infomazione "A. Faedo"
The overall objective of the XtreemOS project is the design, implementation, evaluation and distribution of an open source Grid operating system (called XtreemOS) with native support for virtual organizations (VO) and capable of running on a wide range of underlying platforms, from clusters to mobiles. The approach we propose is to build a Grid OS based on the existing general purpose OS Linux. A set of system services, extending those found in the traditional Linux, provide users with all the Grid capabilities associated with current Grid middleware, but fully integrated into the OS. The underlying Linux is extended as needed to support VOs spanning across many machines and to provide appropriate interfaces to the Grid OS services. Installed on each participating machine, the XtreemOS system provides for the Grid what an operating system offers for a single computer: abstraction from the hardware, and secure resource sharing between different users. It thus considerably eases the work of users belonging to VOs by giving them (as far as possible) the illusion of using a traditional computer, and releasing them from dealing with the complex resource management issues of a Grid environment. By integrating Grid capabilities into the kernel, XtreemOS also provides a more robust, secure and easier to manage infrastructure for system administrators. 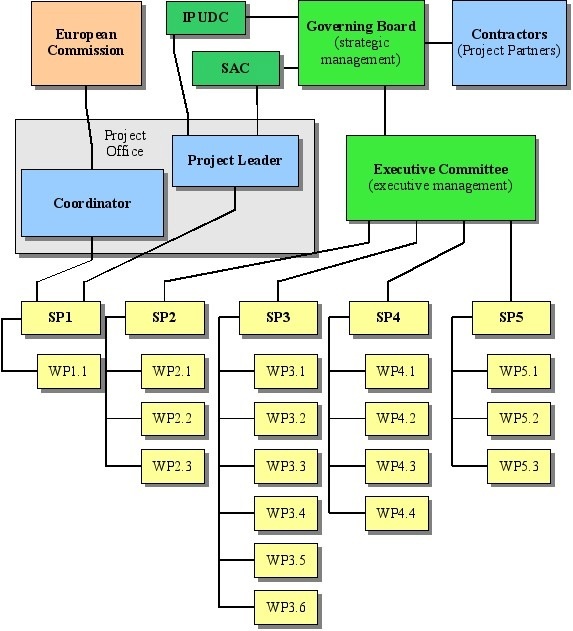 The operational, decision-making and other bodies are shown in the following image. The Scientific Advisory Committee, composed of experts from academic and industrial entities, both internal and external to the consortium, is a scientific evaluation consultative body. It advises the Project Leader on project orientations and evaluates the progress of the implementation plan as well as the achieved results. A IUPDC is set up to assist the Project Leader and the persons in charge of the dissemination of knowledge in WP5.1 (Communication, Dissemination and Exploitation) for the day-to-day management of the knowledge. The IUPDC is in charge of updating of the pre-existing know-hows and preparing the plans of protection, use and dissemination for the Executive Committee and Governing Board. The IPUDC is composed of 6 persons, of which 3 representatives of the Academic Contractors and 3 representatives of the Industrial Contractors.